The Best American Presidents of All Time is a somewhat nebulous list. The methodology for choosing the best changes from one poll to the next, and the criteria varies with each historian's personal biases. But over the years, there has been a general top 10-12 most historians agree on: Lincoln, FDR, Washington, Jefferson, Teddy Roosevelt, Truman, Eisenhower, JFK, Wilson, Jackson, Reagan, and James K. Polk. That's right - James K. Polk. 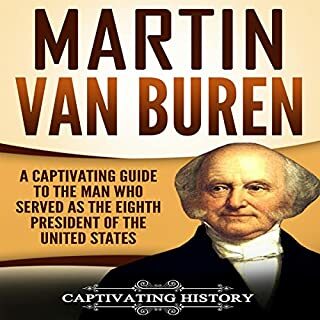 This is a major political biography of a great American president who won a war, transformed the government, and doubled the size of the United States...in four years. When Polk was sworn in as the 11th president, what followed was one of the most consequential presidencies in history. Against his opponents, he unabashedly proclaimed U.S. policy to be one of continental expansion. 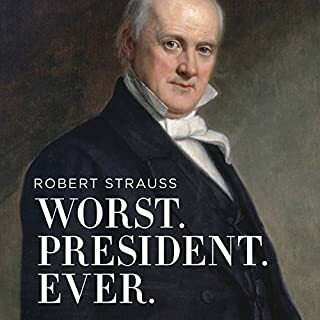 By the time he left office, Oregon, California, New Mexico, and Texas had been admitted into the Union, and Congress' mandate to wage war was forever rendered a rubber stamp by a transformed and empowered executive branch. True to his word, Polk stepped down after one term. He remains relatively little known. In fact, no full-length modern biography of Polk has ever been written. Until now. President James Knox Polk, the man behind "Manifest Destiny" is finally being written about. 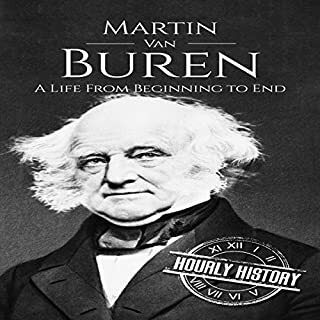 Walter Borneman does a splendid job in putting down Polk's life story even though it does not have the military flash of a Jackson or a Grant. He does fill in the holes left by the only other Polk history to have come out in the last few years, James K. Polk: 1845-1849, as part of the American Presidents series. It was a very good general information book that was in need of a book like Polk: The Man Who Transformed the Presidency and America. Read this book. It will go a long way in filling in some of your blanks in American History. I learned a few interesting pearls from this book. Polk said he would only serve one term when he was running for election and he listed items he wish to achieve in the 4 years such as bring into the U.S. Texas, New Mexico territory, California and the Oregon territory. And he did this but had to fight a war with Mexico to achieve it. He also achieved some other items along the way. His wife Sarah had the band play a Scots march at formal occasion whenever Polk arrived at the event. The tune was "Hail to the Chief" and is still played today. The book cover lots of information about the politics of the day and a good overview of how California, Oregon, New Mexico and Texas came into U.S. control. Alan Nebelthau did a good job narrating the story. His life long health problems interest me so I am off to see if I can find out about them. His wife appears to be an interesting first lady I shall get a book about her also. James Polk was the president who brought Texas into the Union. He also added California, and the states of the Southwest. He made war with Mexico to achieve those ends. He also made peace with England that defined the northern territorial line of the United States and finally settled the Oregon Territory question for good. Born in North Carolina his family moved to Tennessee when he was a young man. After studying law he moved into politics. His most important mentor was Andrew Jackson. Jackson even introduced young James to Sarah Childress who would marry the up and coming politician. Polk's early career was meteoric. At the age of 30 he was elected to the House of Representatives. He would serve 7 terms and the last two terms he would spend as the Speaker of the House. He was elected Governor of Tennessee. Everyone thought that he would be an easy presidential contender. Then he lost his reelection bid for governor. He then lost the second attempt at the governor's office four years later. Everyone assumed that Polk was finished. Then, in 1844, the Democratic Convention was unable to agree on a candidate for President. Polk became that candidate. Everyone knew that admitting Texas to the Union would cause a conflict with Mexico. The territory between the Nueces and Rio Grande Rivers was claimed by both the United States and Mexico. Polk sent troops to occupy the region. A group of American cavalry were attacked by a force of Mexican cavalry. Several Americans died in the action. Polk requested a declaration of war because "American Blood has been shed on American soil." As a result of the war Polk was able to expand the boundaries of the United States. The war was controversial and Polk had to contend with the opposition led by the elder statesman John Quincy Adams. Assisting Adams on the opposition was a young Congressman from Illinois named Abraham Lincoln. Polk ran with the promise to serve only one term. He kept his promise. After his term of office ended Polk took a tour on the way home to Tennessee. After his return home he became ill and died only three months after leaving office. 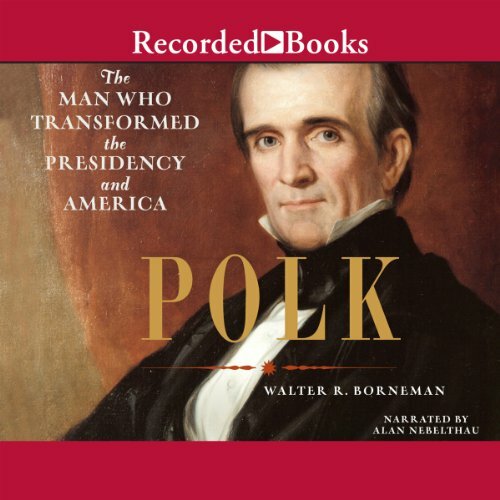 Walter Borneman is a well respected historian and he has given a wonderful look at the life and Presidency of James K. Polk. This book is well written and is a good look into the issues that led only eleven years after his death to the Civil War. 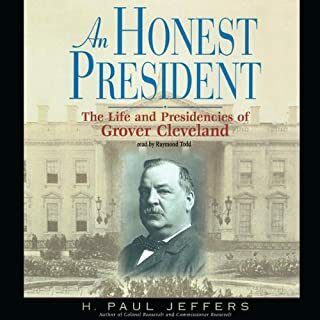 An unknown President shines in this book! Would you consider the audio edition of Polk to be better than the print version? I enjoy the audio versions of most books. The only way this book in written form would have been better is if there were maps and pictures not included in the audio version. Henry Clay was the most illumanitating person in the book. 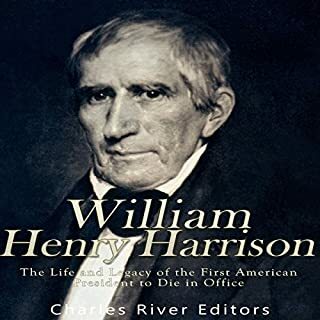 I had of course heard of him previously but at least according to this book, Henry Clay was the most hard-headed uncompromising man that ever lived. We are lucky he never made it to the Presidency. What about Alan Nebelthau’s performance did you like? No, it is a good listen but not all at one time. The performer is a speed reader! Yes I would... It was a wonderful story filled with details and flowed well. Who would you have cast as narrator instead of Alan Nebelthau? NO.... This guy is a speed reader... I drive a lot and enjoy listening to books. The narrator speed of reading actually made me nervous like I had too much coffee. I had to relisten to several parts because he just went through it so quickly. No I didn't but I enjoyed the story. This period is covered much better in the oxford history of america. Under the radar, over the top! When one thinks of the great presidents, Polk is usually not one of the names that floats to the surface. I believe, if more people understood what he did, and how his actions changed our country, he would be included as one of the most effective presidents that ever served. He is certainly one of the most tenacious in effecting his goals, and then leaving office after having done so in one term, despite the entreaties he received from his peers at the time to seek a second term. I think that we will never see such a straight forward president again, as the electorate would not tolerate it now. Vacillation being the preferred tendencies in today's candidates and elected officials. This book reads more like a novel, as the cast of characters is vast, and it encompasses such and eventful time in our young country's history. If you love history you should enjoy this book. Not a barn burner, but a good solid listen that will leave you well informed. The narration is good as is the writing. I recommend it. Hopefully there would be a cure for cancer. This president passed from it. I know. Absolutely. The author justly notes that Polk is often ranked in the top quartile of presidents but is relatively obscure compared to his other highly ranked peers. This was a great book in that it provided a lot of historical context for both Polk's legacy and the 40 years leading to the Civil War. My major issue with the book was that I constantly felt like I was being sold on Polk's greatness. Although the book is fair when dealing with Polk's strength's and flaws he attributes every outcome to Polk's own will rather than circumstance. The book is obviously a rebuttal to some historical sentiment that put's the achievements during Polk's presidency (or even his becoming President) to inevitabilites of history or other characters such as Jackson, but in being so singularly focused on proving Polk's pivotal role in all major events the book lacks balance. 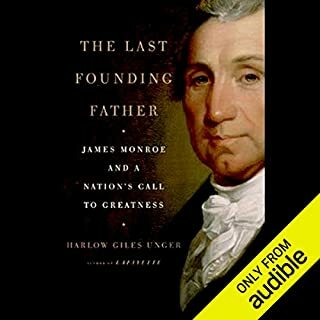 Ultimately, I still recommend it for anyone who enjoys Presidential history and like myself, lack a great appreciation of the periods between the foundational American Presidents and the Civil War. As a petty aside that I have to get off my chest, the constant reference to Polk as "Young Hickory" drove me crazy. It is such a small and petty thing, but it took me out of the story every time it happened. What was this book about? I enjoyed this book, but it wasn't what I thought I was getting. My intention was to learn about president Polk, I knew next to nothing I am ashamed to say. This book however spent more time on the other people around him than on him.